When was the last time you took a really deep breath, other than just now after reading this sentence? Because the breath is an involuntary human mechanism, we often neglect to pay much attention to it. It’s always there so we trust that it must be working properly, right? There are so many reasons to breathe deeply. 1. It Revs You Up. Maintaining a steady breath during your workouts over time (not to mention walking up the stairs or running to catch the bus), can help your cardio system become much more efficient. 3. Not Doing it Can Make You Fat. A direct result of fight or flight mode is overloaded adrenals, which also causes storage of body fat. Not good! One of the main restrictions of easily taking a deep breath is tightness in the front and back chest cavity. Its like putting a balloon in a glass container and trying to blow it up to its full capacity. The balloon will only go as far as the glass container will allow. – Wrap a belt or scarf around the bottom of your ribcage. With your elbows at your side and your forearms at a 90-degree angle, hold the belt firmly in your hands. You should feel slight resistance in your back against the belt. As you take a deep breath in, see how much you can expand your back against the belt. – Roll up a blanket and place it on the floor. Lay face-up on the blanket with it running across your back, just at the bottom of your shoulder blades. 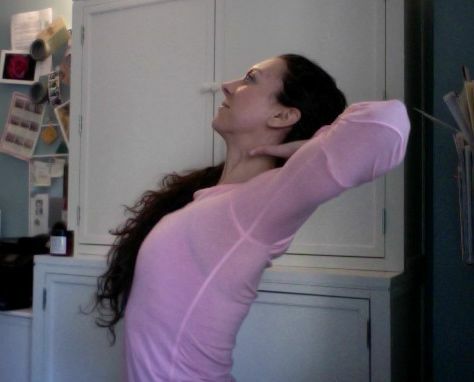 Relax your head back and gently take your arms overhead to increase the stretch. Breathe deeply. Feeling a little BLUE today?